RevEquip collaborates with design professionals to build 3D Revit symbols, called Families, which are placed into Revit projects. Revit is quickly becoming the preferred BIM (Building Information Modeling) program by the design industry. 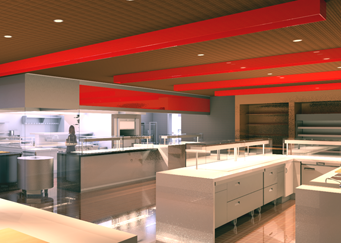 Our team is made up of design professionals specializing in Revit with backgrounds in foodservice consulting, engineering, and architecture. We build Families quickly and efficiently using 3D Revit symbols with the needs of the client in mind. Whether it’s creating full libraries of Revit content for a Manufacturer or creating custom Revit Families for specific project needs, RevEquip has your solution. Families are built according to trade standards. RevEquip utilizes templates that reflect the guidelines for a specific trade. 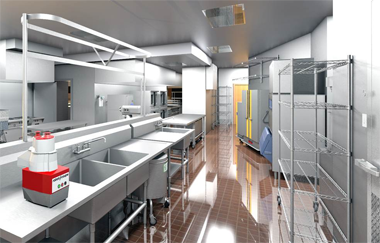 For example, RevEquip uses the standards created by the FCSI Revit Taskforce for the Creation of Foodservice Revit Families. Families are created to work as efficiently as possible. Families can get very complex and elaborate; consequently, the more complex, the larger and more difficult it is for designers to understand. Families need to be large enough to properly display necessary options and features, but small enough to operate with ease. Families can only contain necessary information. It is important a Family looks like the equipment it is symbolically representing, but too much detail can give away proprietary information. We “don’t want to throw the baby out with the bath water,” and there is a fine line when determining what content needs to be disclosed. We work closely with the client to only include what is deemed necessary for Family Construction according to the manufacturer. Families are built natively in Revit, never converted from 3D CAD blocks. 3D CAD Blocks are problematic when used in Revit projects. The options to modify, constrain, and apply multiple materials are limited when using import CAD blocks. Moreover, when used excessively they can bog down and create issues with computer performance. FCSI standards do not recommend the use of imported CAD blocks. Additionally, 3D blocks shouldn’t be used because they show every faceted line and look unnecessarily complex. We are in this together. RevEquip believes that learning is a two-way street. Listen! Listen! Listen! It’s the years of innovation and work that give a manufacturer or consultant value. We understand that we need to immerse ourselves into your company culture and quickly learn the inner workings of the objects we are creating. RevEquip offers competitive pricing and speedy turnaround for our Revit services. We have many Revit stations dedicated solely to Family Construction which allows for a quick turnaround. A number of factors will determine the cost of a family; the main contributing factors are the complexity of the family and the quantity of families on the contract. A very complex family takes more time in construction and therefore has a higher cost. If a client orders a large number of families, the efficiency of creating the family goes up and the price, in turn, will go down. The price of a family can range from less than $100 to several hundred dollars; pricing varies from item to item but is always competitive. Fill out and submit our Request Form to get a customized quotation for your project.